Never Fear, the Monarchs Were Here! I don't like chicken wings. Chicken wings are bony things with not a whole lot of meat on them and it's dark meat at that. I like white meat. In fact, I love chicken breast just about any way you want to fix it. But I don't care for dark meat. So when we pulled into Wendy's drive-thru recently and I saw they had a new item on the menu - Asian Chicken - my taste buds got excited. I read their description - plump and juicy all-white meat cut from 100% whole chicken breast - and I knew that it was going to be just the thing that satisfied my appetite. But instead of "Asian Chicken" showing on the order screen, I saw "Asian Wings". I told the young lady taking my order that I didn't order wings, I ordered the Asian Chicken made with chicken breast. She said, "Asian Chicken is wings." I again stated that I didn't want wings, I wanted the breast and she continued to insist that the Asian Chicken was wings. Now I have cut up a chicken or three in my time and I guarantee you that the breasts of those chickens were not the wings of those chickens. To illustrate this, if you look closely at the two photos below, you will notice that the two photos are different. This is because the chicken breast and the chicken wing are two different things. After determining that one of us was confused, I decided to forgo ordering the Asian Chicken, because the last thing I wanted was for my order to end up actually being chicken wings, as was showing on the order screen. I proceeded to order a single hamburger, even though it wasn't what I really wanted. As we pulled up to pay for our meals, I decided I would try again and I asked the person taking our money if they did indeed have Asian Chicken breasts as described (and shown in a photo) on the menu. I thought maybe the person taking the order was new and not yet familiar with the new items on their menu. I still really wanted that Asian Chicken, as long as it was made from the breast. The money taker looked at me with a blank stare as if to say, "I have no freakin' idea. I just take the money." What she really said was, "I'm not sure what you're talking about, let me get a manager." Well, let me tell you, the manager was in no mood to deal with customers. He leaned out the window and in an exasperated tone of voice and with an equally exasperated look on his face, said to me, "What can I do for you?" As Romie sat rolling his eyes, I once again asked about the Asian Chicken breast that I'd seen on the menu. "Is it wings or is it breast?" I asked, "Because a chicken wing is not the same thing as a chicken breast." He looked at me and said, "Correct." Silent stares were exchanged between us. We were getting nowhere. Well, that's not entirely true, because I was getting more confused while the manager looked as if he understood everything just perfectly and what was my problem anyway? At this point, he asked if I would like the 800 number for Wendy's, which I politely declined. I prefer to deal with corporate via e-mail. We paid for our order and proceeded to the next window, where the person who had taken our order thrust the bag containing our food at us and said, "Here." I think maybe I wasn't their favorite customer that day, but I honestly wanted to know just what the heck their Asian Chicken really was. Is it wings or is it breast? We left Wendy's and I got my cell phone out and called my dad. In earlier years, my dad owned a grocery store and also did custom butchering. If anyone could clear this up, it would be my dad. "Dad? You know about parts of a chicken, don't you? 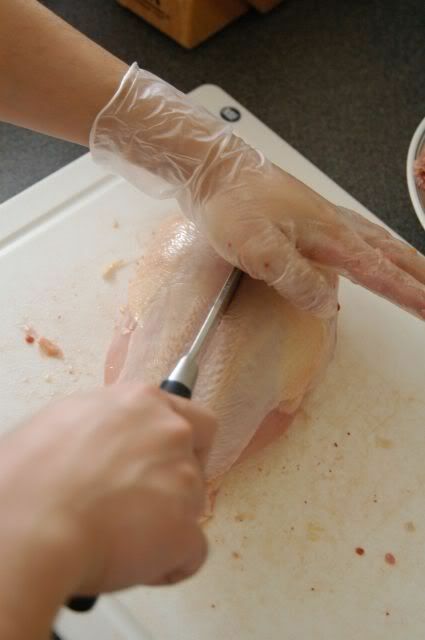 The wings are dark meat and the breast is white meat, and they aren't the same parts, are they?" Dad kind of laughed and said, "Do you really need me to tell you that?" I answered, "No, but maybe someone needs to tell Wendy's that." Now those of you who eat wings and don't give a hoot whether they're white or dark meat are probably thinking I'm making a big deal over this, but if you're a picky eater like I am and you know the difference between a wing and a breast, you'll understand the point of all of this. But right now, I'll cut to the chase. 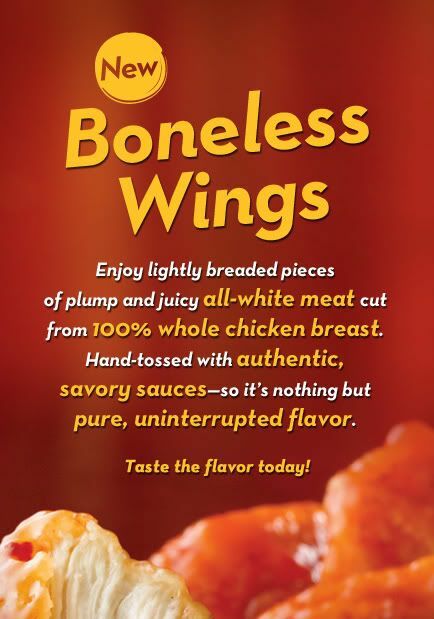 From what I can gather from their website, Wendy's takes white meat from a boneless chicken breast, cuts it up, lightly breads it, and cooks it in a sweet and spicy sauce, then calls it Asian Chicken wings even though it isn't really wings. To that, I can now only ask, "Why?" As I was relaying this story to a good friend of ours, he said I should have asked the manager, "If your girlfriend asked you if you'd like to feel her breast, then gave you her arm, would you be happy with that?" I nearly choked on my hamburger. 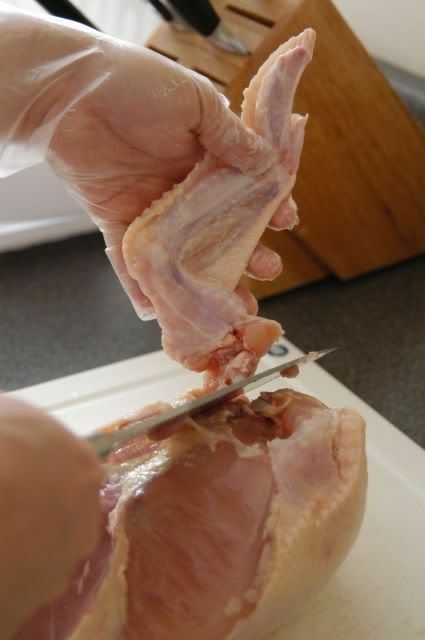 Photos of chicken parts from Cooking For Engineers. 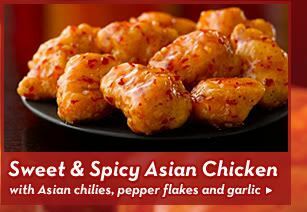 Photos of Asian Chicken from Wendy's. Looks like breast to me. But it's wings. Sigh. In the past few weeks, I've been whining about the lack of Monarchs in the garden. The first one of the season that I spotted was way back in late May and its early arrival made me think there would more of them than usual this summer, but we've only seen two more since then. 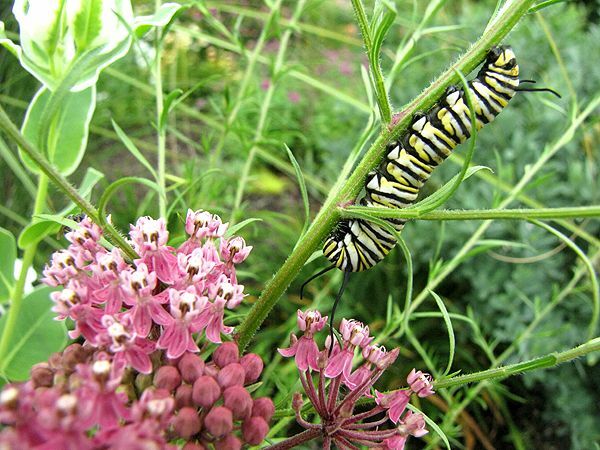 We have prepared a banquet of Asclepias plants of various sorts for their babies to munch on and heaven knows there's no shortage of nectar, so where are the butterflies? Every day I do at least one walk-through of the garden, where I simply observe and enjoy whatever happens to be blooming and growing there. No weeding, no deadheading, just a nice relaxing stroll. Usually, my camera is hanging around my neck, because every time it isn't, you can be sure I've missed a photo op and I'm sent running back to the house to retrieve it. Today I walked around behind the fence that runs on two sides of Max's Garden so I could get a better look at the blooming sunflowers. They are being shy this year by showing only their backsides to anyone who walks through the garden. 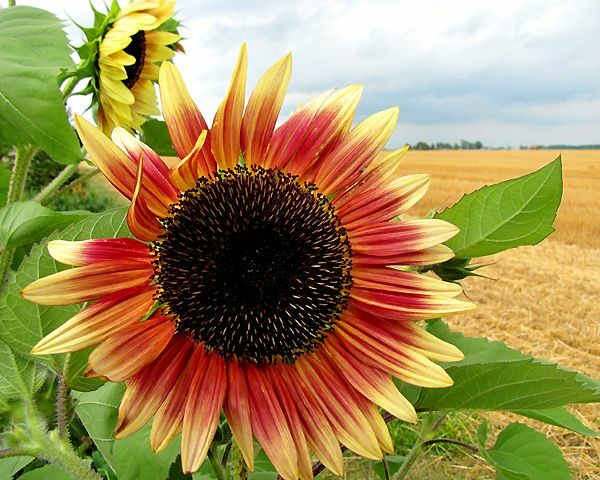 I've planted sunflowers in the past and we always had blooms facing east, south, and west. This year, they all face east. All. Day. Long. After I had a good look at the 'Apricot Twist' seeds that grew up to be something else (mislabeled seed packet?? 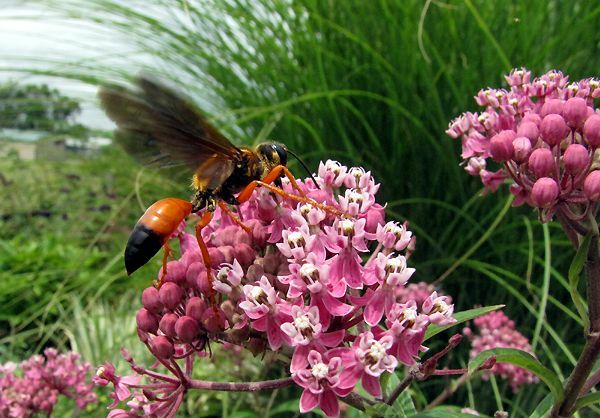 ), I wanted to take a close look at the Swamp Milkweed (Asclepias incarnata) that grows lush and full back in that same corner. 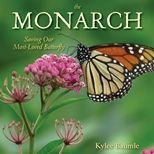 Observation has taught me that the Monarchs love this plant the best of all and it usually plays host to several Monarch caterpillars at a time throughout the summer. My goal was to see if I could find any eggs on its leaves, which would be evidence that at least one Monarch had been here. The first thing I saw was a gigantic wasp. I think it may have been longer than the Cicada Killers! 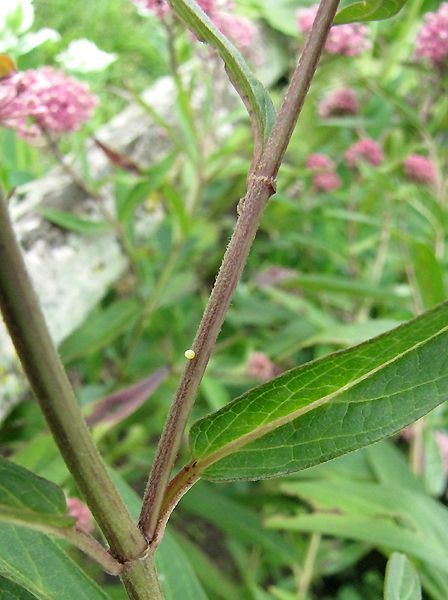 All of a sudden, something caught my eye and there was no need to me to look for Monarch eggs. There was a full-grown Monarch caterpillar that was large enough to tell me that a chrysalis is in the offing. A quick scan of the rest of the plant showed another smaller one. I still looked for eggs because I'd never seen one before (I'd never looked). It didn't take me long to find a few of them, each singly laid. 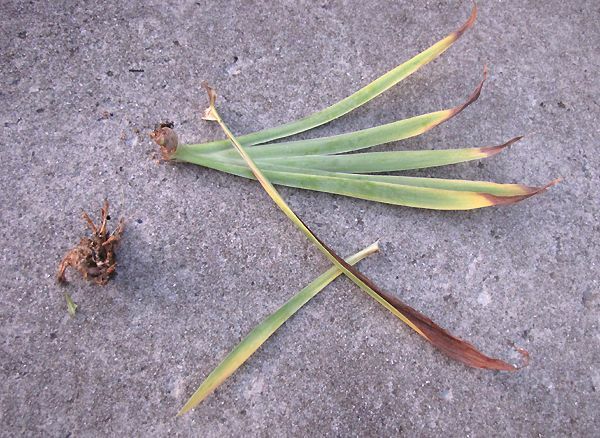 Two on leaves and one on a stem. 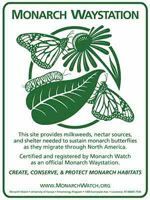 So all is well in our Monarch Waystation. They've been here, they are here, and they will be here. 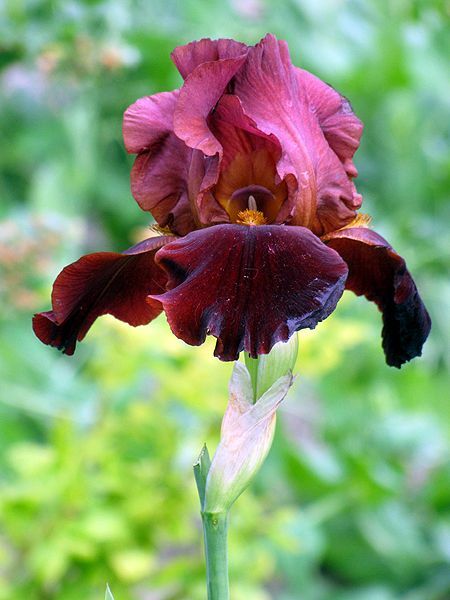 Yesterday, when I blogged about the wicked and disgusting Iris borers, Romie made the comment, "It's always something." So true. And today's something is dodder. Never heard of it? Neither had I. I'd never seen it prior to this summer either. I'd noticed orangey threadlike tendrils had been winding themselves around some of the Asclepias curassavica (Scarlet Milkweed) seedlings for a couple of weeks now. I tried pulling them off, but it wasn't as easy as it looked. Just when I thought I had it all, there was some more. And it was so tiny and so tenacious!This morning, I posted a description of what we had on Twitter and asked if anyone knew what it could be. I hadn't yet taken a photo of it, so I thought it might take awhile before someone recognized what I was talking about. But Annie in Austin knew right away: "Hope it's not dodder: http://bit.ly/3rmbZd." 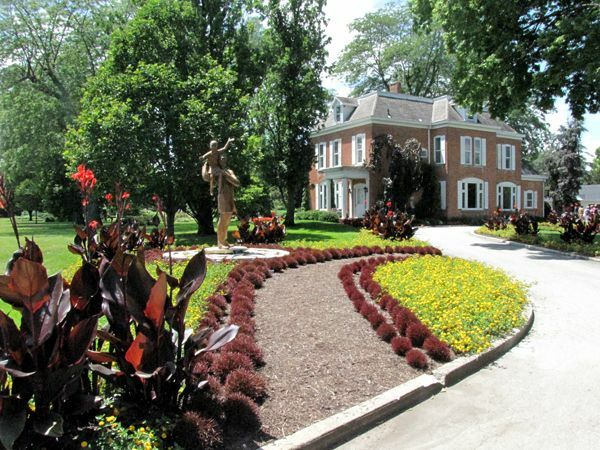 Her link took me to the Missouri Botanical Gardens website, which I've used before in a number of ways, including their Kemper Center for Home Gardening. The information there confirmed that we did indeed have dodder (Cuscuta spp.). Dodder, a member of the Morning Glory family, is an annual here in Ohio, but it readily self-seeds unless steps are taken to eradicate it. 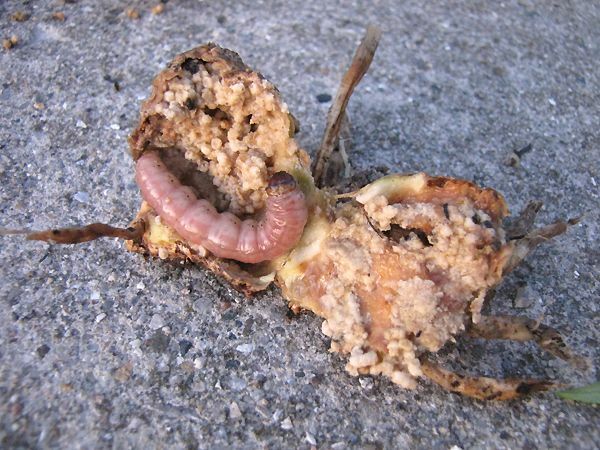 It's parasitic and by living off the host plant, it many times will kill that plant. 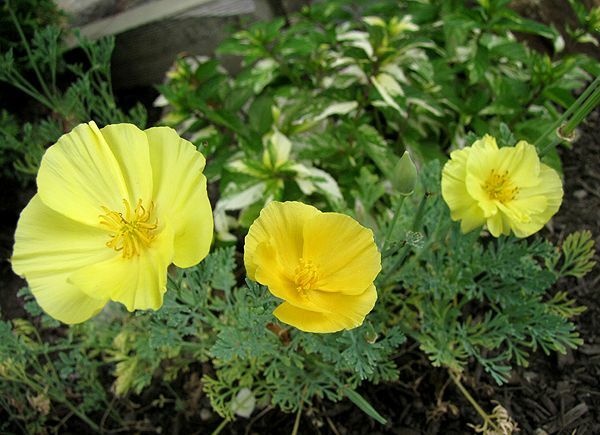 We were fortunate in that it was found in an area of our garden that largely contains annuals. 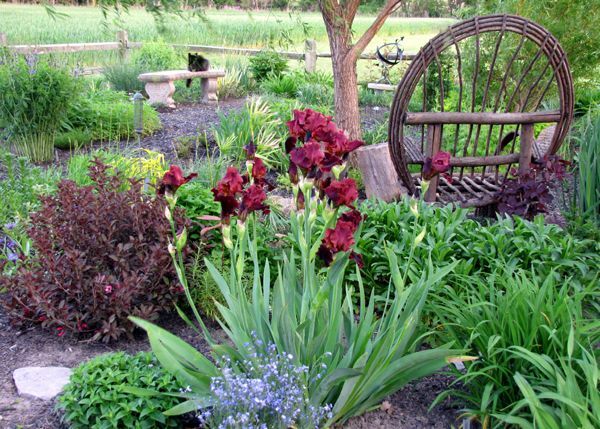 Fortunate in that it's recommended that you remove the infected plants and I'd much rather lose an annual than a perennial, of course. Romie and I pulled the tendrils off and in the end, only had to pull a few seedlings before we got it all (as far as we know). This year hasn't been the best for growing annuals at Our Little Acre. Most of them should be way taller and blooming their heads off by now. 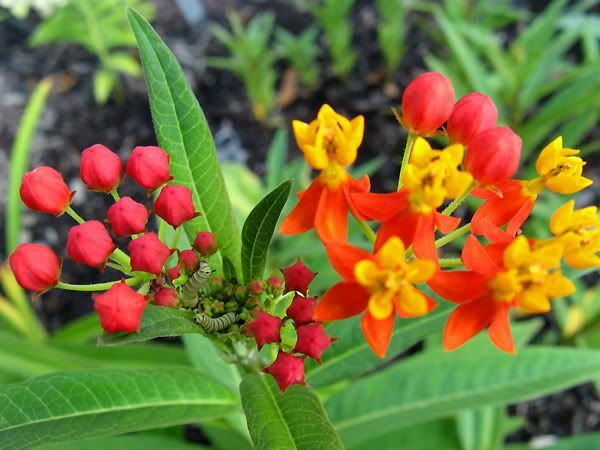 Many of them aren't and this Asclepias is one of them. We just need some good hot weather and some rain! The dodder wasn't having any problems growing though. We'll monitor that area, because I fully expect it to return. I'm checking out the possibility of using Preen® pre-emergent herbicide in the soil there to prevent its return, because that's something we have on hand. Glyphosate (Round-Up®) will kill the plant itself, but I'd rather prevent it from growing in the first place and don't really like using Round-Up® if we don't have to. 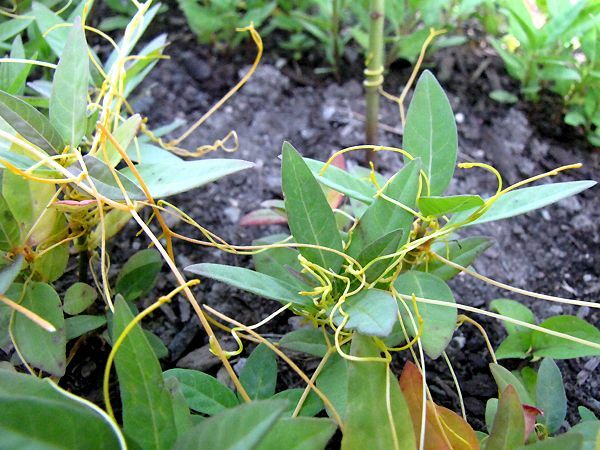 Currently we do not have a garden product that will prevent Dodder weed seeds from germinating, nor do we have a product that will kill existing Dodder. We recommend you contact your local cooperative extension agency for their advice/recommendations on controlling this weed as eradication is almost impossible. Thank-you & Have a good day! Photo of Asclepias curassavica in bloom was taken 8-23-08. If you click on the photo, you'll see a larger version and you might also see something besides flowers! Did that title draw you in? 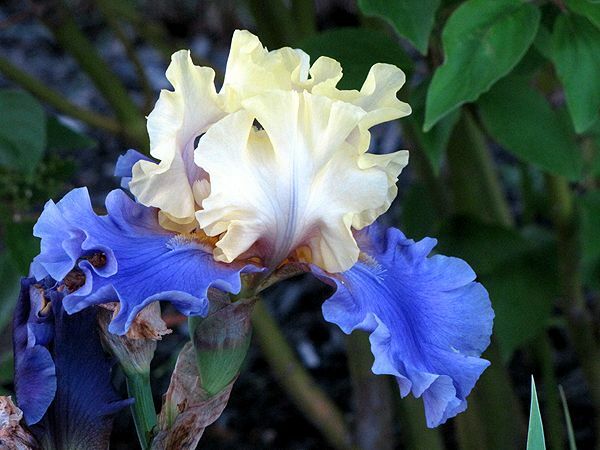 Did you think to yourself, "Irises, boring?? How can that be?" Well, it's not what you think. 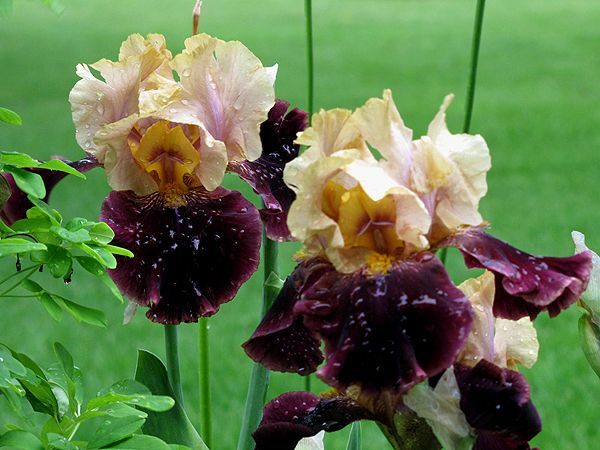 I love Irises and to me, they're anything but boring. I do like some better than others, but they each have their endearing qualities, not the least of which is their colors and they way they're dispersed on the blooms. 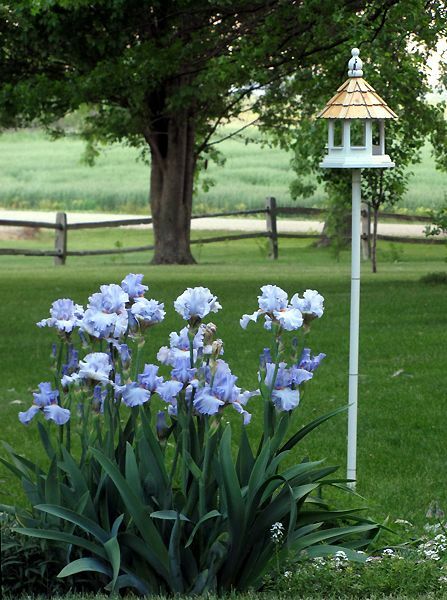 But I'm not the only one who loves Irises. This year, I'm waging all-out war on a not-so-little pest called Macronoctua onusta - Iris borer. I suspected them last year, but hadn't actually found one. This year, a couple of my Irises needed dividing, so I dug them up and it was then that I came face-to-face with the worm. In years past, I recalled pulling center leaves out of the fans because they'd turned yellow. They came out easily and I did suspect that something was causing this, but it didn't happen often and it didn't seem to be harming the Iris a whole lot, so I didn't do anything. Therein lies my grave mistake. The borer lays eggs in the leaves, where they hibernate all winter. In the spring, they hatch and the caterpillars (much too nice of a word for these disgusting things) work their way down the leaves into the rhizomes, where they gorge themselves on the heart of your Irises. 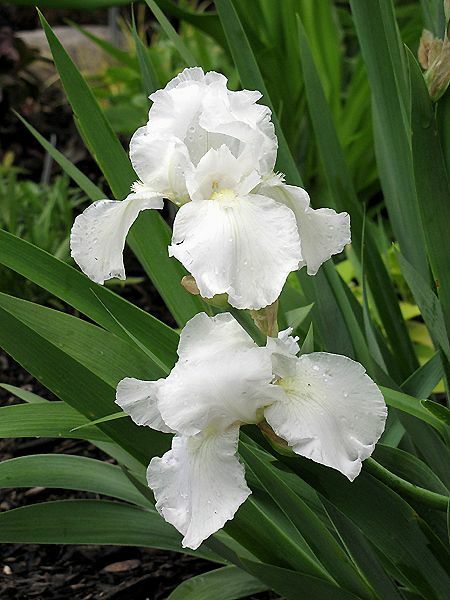 The result is a mushy rhizome and usually death of that particular part of an Iris clump. 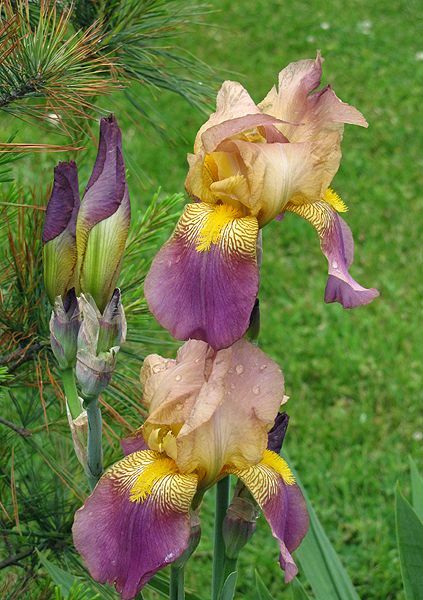 And what's worse, they like Siberian and Japanese Irises too, as well as Blackberry Lilies (Belamcanda chinensis). Ask me how I know. That's the Reader's Digest version of the Iris borer story. For a great detailed tutorial of what to do about this problem, visit The Renegade Gardener's page, Iris Borer Alert! It was two inches long and a disgusting shade of flesh-colored pink. The previous ones I'd found were smaller and white. I suspect the rest of the plant is infected, so when I have more time this week, I'll dig the entire thing up (as I did the others that were infected) and check them. During the last two visits to Schedel Arboretum and Gardens, I drooled all over the Korean Violets (Viola koreana 'Sylettas'). It was a melancholy drool, because I'd once had the beauties in my own garden. I say "once" because they no longer grow at Our Little Acre. It's not that I didn't want the unusually-marked violets anymore. Au contraire! I loved them and hoped they would do as violets are prone to do - pop up everywhere. But they did just the opposite. 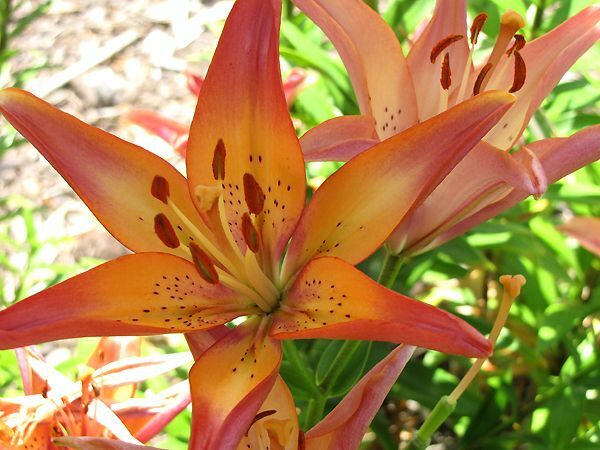 After purchasing them from Bluestone Perennials in 2005, and living for a year after that, they slowly declined and the last they were seen around these parts was oh, back around 2006 or thereabouts. I don't think it had anything to do with where I purchased them or the health of the plants. They looked good for quite awhile and I was happy when I saw them popping up the following spring after I'd planted them. 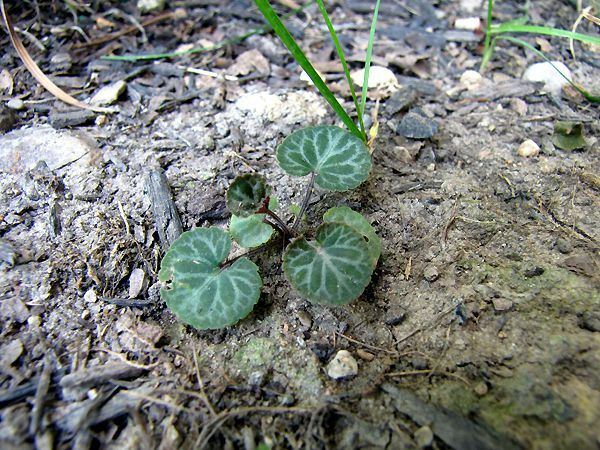 Getting through an Ohio winter is no small feat for some plants, and though violets are among the hardiest, I was still cheering when they unfolded their pretty little leaves for the first time after the snow had melted. But by the end of the season, they were gone. Bluestone quit selling them sometime after that, because in order to ease my heartbrokenness over their disappearance, I thought I'd just buy some more, but they were no longer in their catalog. I vowed to find them elsewhere, but as often happens in the spring of any year, other busy work grabbed my attention and they were temporarily forgotten. So now it's 2009 and I'm strolling through Schedel's Japanese Garden, and oh my...what a healthy, large crop of Korean Violets there is! As I said, drooling ensued and I was hopeful that I'd find a small pot of them sitting in their "For Sale" area. Nope. So I asked at the Visitor's Center if they might sell me some. Nope. They liked them too, of course. I have looked again for places to purchase the violets and found a few. I must get right on that before something else distracts me. 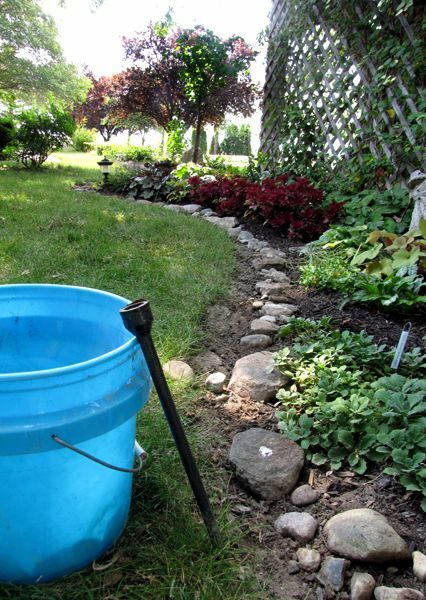 Something like a garden task that is still on my list. 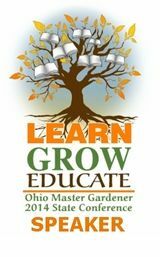 As I said before, our gardens are one of eight on the menu of the Van Wert Master Gardeners Garden Tour on August 9th. There are always things to be done in the garden throughout the summer, but because of the upcoming tour, I feel a bit rushed instead of doing things at my leisure. Today, the task was redoing the stone borders around some of the gardens. Several years ago, I laid field stone we'd gathered from the farm fields around our house. Over time, the rocks sank deeper and deeper into the ground and in some cases, they had become completely covered by soil and mulch. 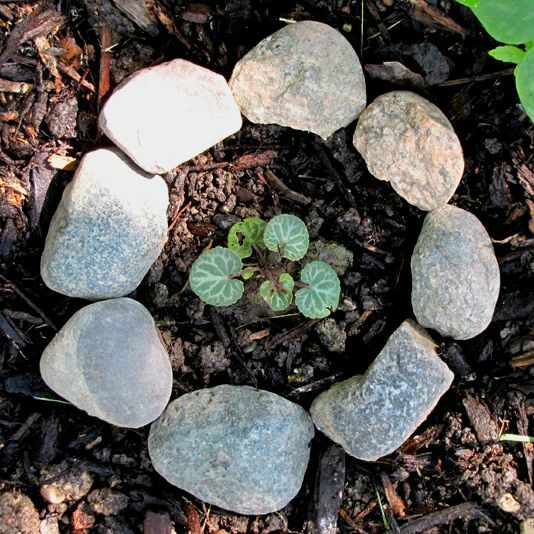 I was down on my knees, working on lifting the rocks in the Trellis Garden border, when I came across a tiny plant, no more than two inches across at its widest point. When it registered as to what this plant actually was, I let out a holler across the yard to Romie. 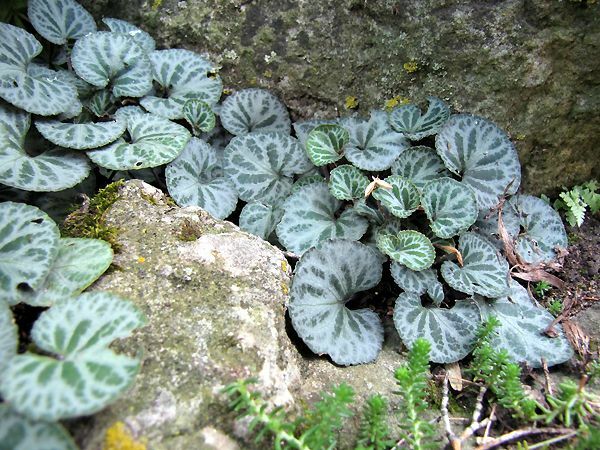 It was a Korean Violet! I couldn't believe it. It was growing in rock-hard clay, about two feet from where I'd planted the original clump four years ago. 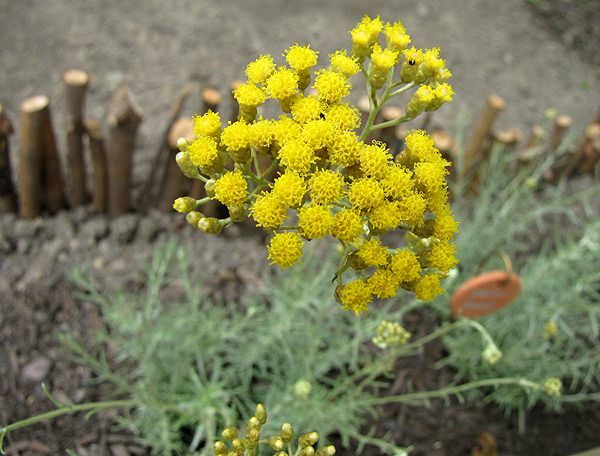 It had probably bloomed, produced seed, and the tiny seeds had lain dormant until this year. Violet seeds need light to germinate, so it probably got exposed during spring, when I planted something new near this same location. I debated whether or not to move it, not wanting to take any chances of losing this tiny treasure, but it was growing in a location where it was likely to get trampled accidentally, so I decided to move it to the garden just north of the pool house. There it will be in dappled shade and pretty much out of the way of errant feet. I put a circle of stones around it to remind myself that it's there, since it really is very small. I'm hoping it will grow large enough to bloom and produce seed and then spread. Never underestimate the power of a seed! Two winters ago, Romie and I took a walk down the old railroad bed in my hometown. Being winter, not much was looking green, but we noticed a fuzzy plant that seemed to be laughing at the frigid temps and the snow. It fascinated me and when spring came, we returned to dig it up for relocating in our garden. Soon I learned that our little plant was Common Mullein (Verbascum thapsis) and that it wasn't going to stay little for long. 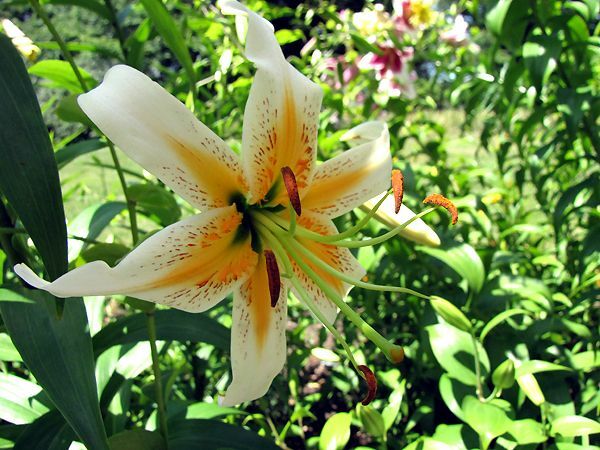 I planted it in a mostly shaded spot in the heart of Max's Garden and that first summer (2008), it shot out a flower spike that grew to maybe four feet tall, but I'd expected taller. The way each leaf comes off the main stem reminds me of a ruffled pinafore. This year, we moved the Mullein to the Orphan Garden, where we grow a variety of things. If a plant isn't performing well, I put it in the Orphan Garden to give it one more chance to straighten up and grow right. If it doesn't, into the compost it goes. That's a short trip, because the compost bins are right beside the Orphan Garden. I didn't move it because it wasn't growing well, I just didn't like where it was and didn't quite know where to put it just yet. It became clear pretty early on this spring that the Mullein was going to grow taller than four feet in this new location. 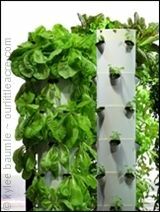 You could almost watch it grow taller from one day to the next. This photo was taken on July 9th and at this point it was just over seven feet tall (Romie is 6' 1"). Today, just ten days later, it stands more than eight feet tall, is sprouting auxiliary stems, and shows no signs of slowing down. 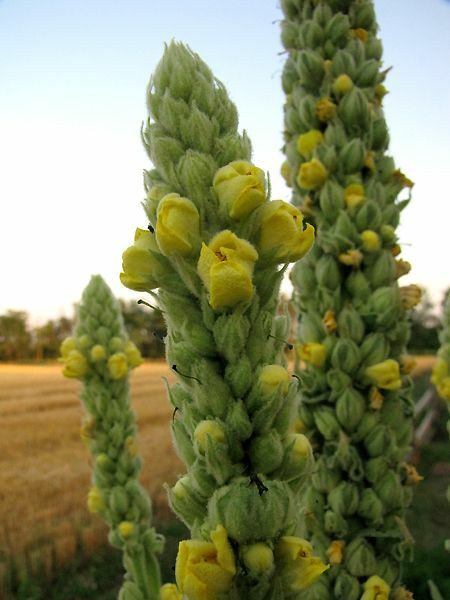 Common mullein blooms from June through September. Plants must reach a critical size before flowering is initiated, which normally occurs during the second year but may be delayed until the fourth year of growth. An individual plant produces 100,000 to 180,000 seeds. Seeds have no special mechanisms for dispersal and usually fall close to the parent plant. Once buried in soil, they can become dormant and survive for years. 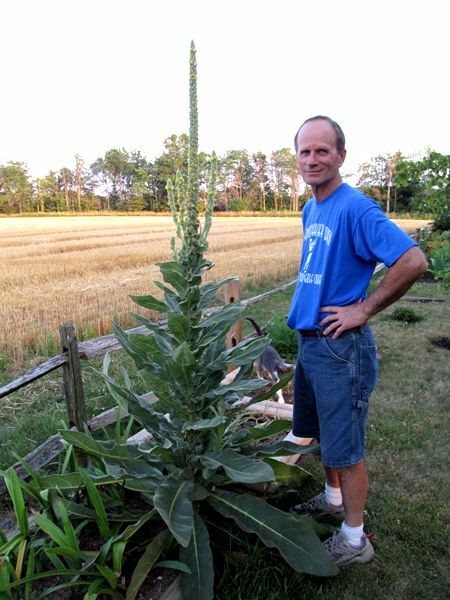 In a study begun in 1879, common mullein seeds buried in soil remained viable for 35 years. 'Mullein' is from the Latin 'mollis' meaning soft. 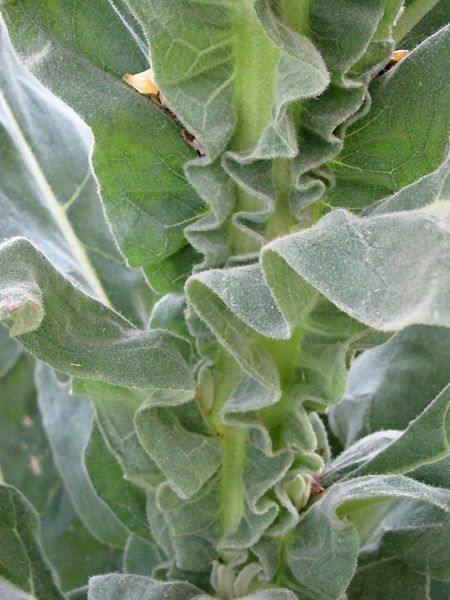 Leaves of common mullein have been used as lamp wicks and Romans used plants dipped in fat as torches. 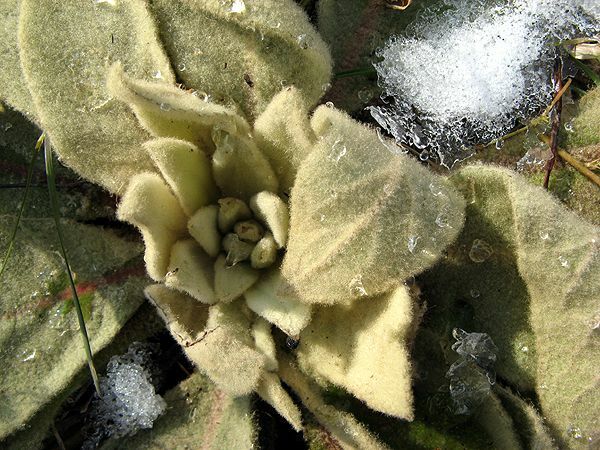 Leaves of common mullein were placed inside shoes for warmth. Quaker women, forbidden to use makeup, rubbed the leaves on their cheeks to give the appearance of wearing rouge. 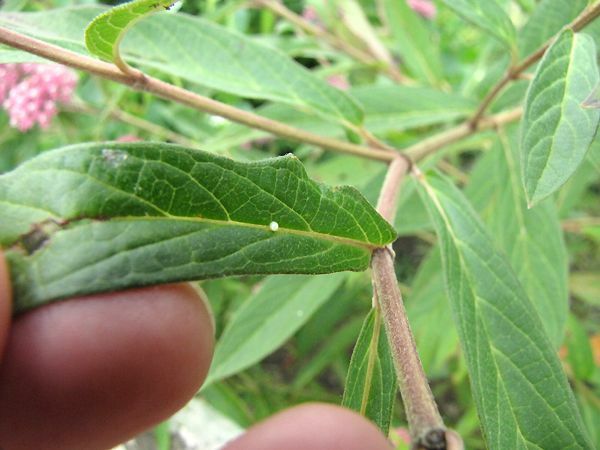 The hairs on the leaf caused an allergic reaction to the skin, thus turning the skin red. 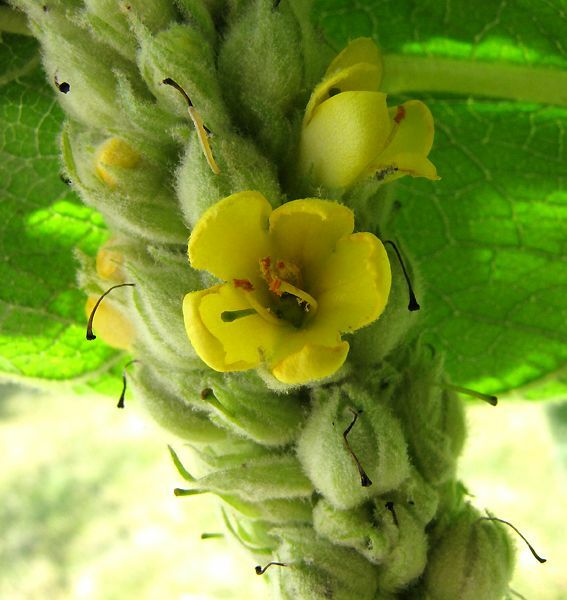 A yellow dye made from common mullein flowers was used by Roman women to color hair. I wasn't going to participate in Garden Bloggers Bloom Day this month, then I took a walk through my gardens with my camera hanging around my neck and there were some things just begging to be photographed. July always promises great color in the garden and this year's version is no exception. 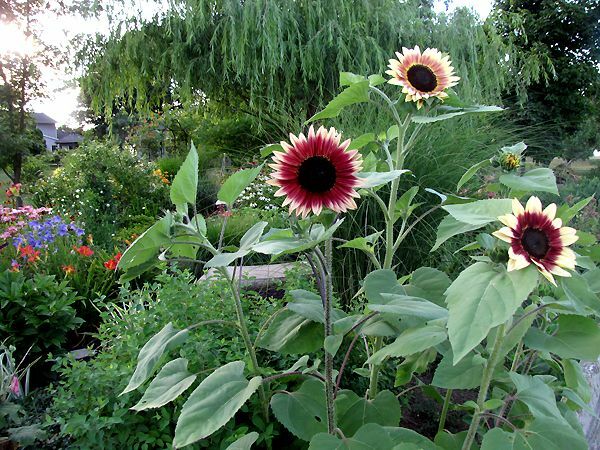 The only thing wrong with these sunflowers is that they always face east and they're on the east edge of the garden. Facing the wheat field. I have to jump the fence to look at them! 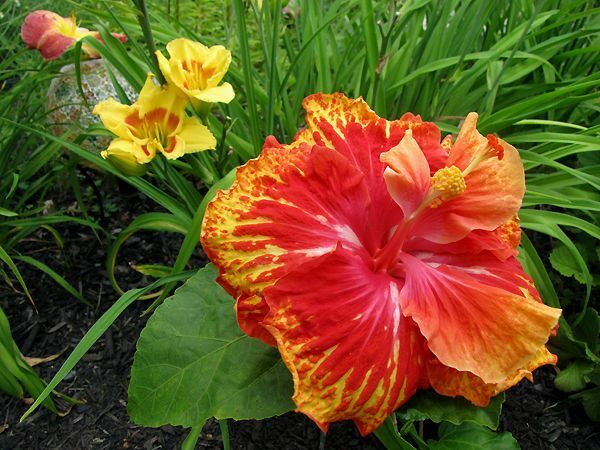 Hibiscus rosa-sinensis 'Sun Showers' with Hemerocallis 'Leprechaun Eyes' in the background. 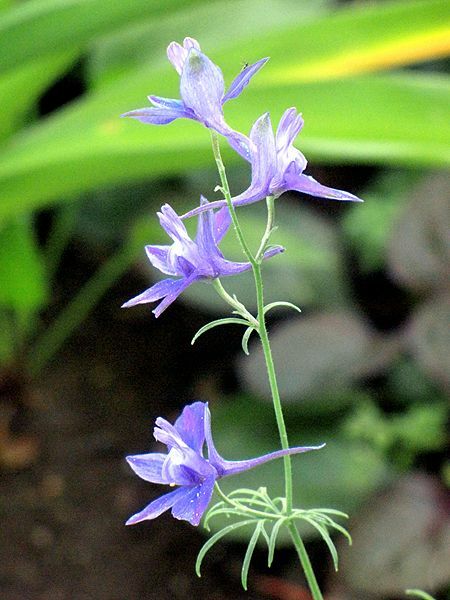 My mom gave me a jar full of seed that was labeled "Larkspur." I planted it and this is what I got. Feathery foliage and a mixture of colors of blue, pink and darker pink. Consolida regalis, maybe? Lovely! I've seen hardiness for this one listed at both zone 5 and zone 6. Of course, I'm hoping for 5. Just to the left of these, out of the picture, grows Sea Holly (Eryngium planum). 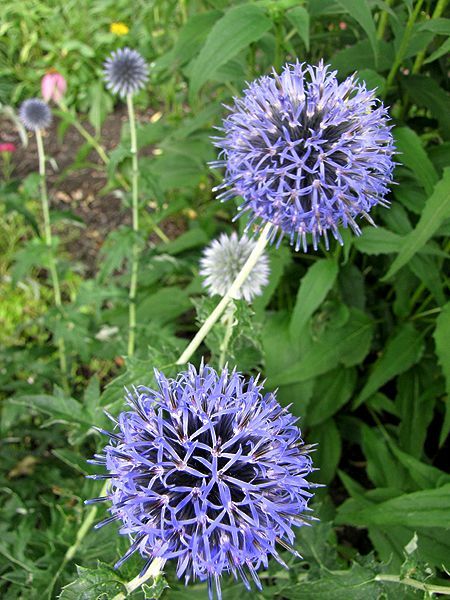 It's blooming now, too, and its purply-blue stems and blooms are a nice echo. 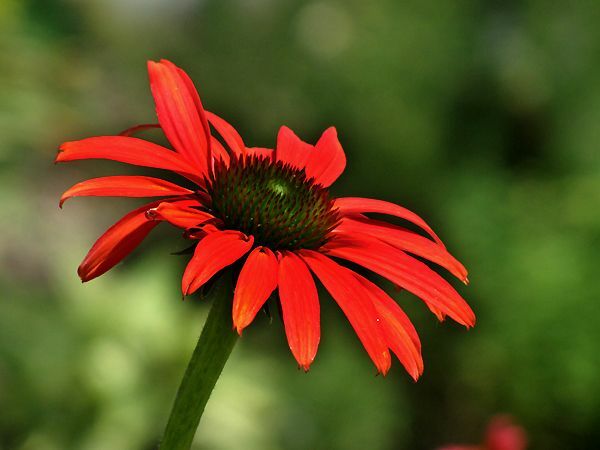 The camera generally has a hard time with reds, especially when the sun is shining on them, but this Echinacea 'Tomato Soup' is pretty true to color. California poppies, like poppies in general, are normally not the easiest things for me to grow, but this year I've gotten more blooms than the single one I got last year. Highly fragrant. I go out of my way to catch a whiff of this when I'm in the garden. Yummy! I'm thrilled to pieces that I've got two good plants of this from the many seeds I sowed. 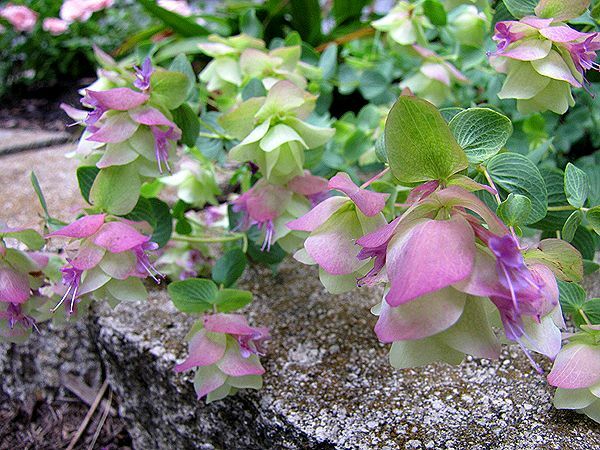 This is one plant that I find very difficult to grow, but I absolutely love those bells! This was one of those pre-packaged deals at one of the big box stores. Can't get enough of those sunflowers! 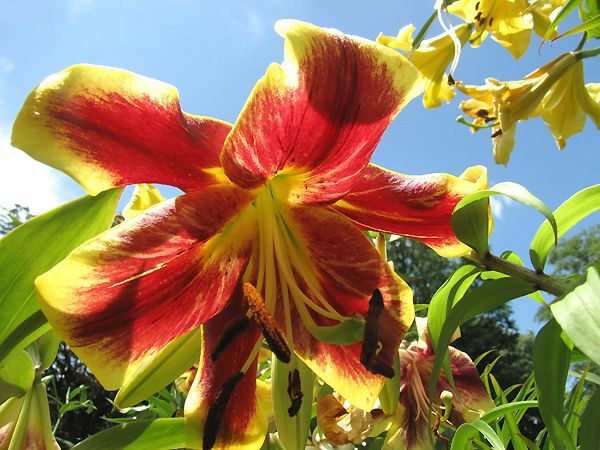 Visit May Dreams Gardens to see more great July blooms! I've been fascinated by herbariums ever since I first found out what they were. 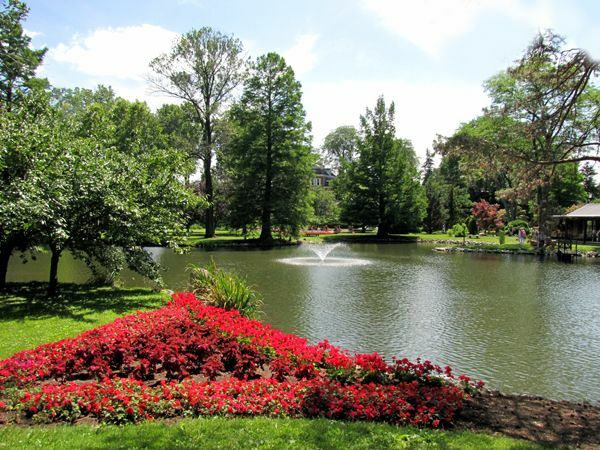 Towards the end of the 19th century, it became popular to collect specimens of plants, including foliage and flowers, press them and preserve them. Properly done, each was labeled with their Latin name, common name, where collected, and when. I have actually started one of my own, with plants grown in my garden. Edvard Koinberg, a Swedish photographer and gardener, has done an herbarium using plants he's grown in his garden, too. Except his herbarium consists of photographs of those plants, not the actual plants themselves. The remarkable thing about his photos are not necessarily the plants, but the intimate way in which he has photographed them. 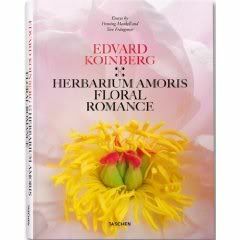 Inspired by fellow Swede Carl Linnaeus, considered to be the father of binomial nomenclature and taxonomy, Koinberg focuses on the sexual parts of plants. By human comparison, this collection is surely X-rated, but worthy of a venerated spot in every library. Rarely has a book had such an effect on me as this one. Within five minutes of browsing through its pages of breathtaking images, I was nearly moved to tears. I don't need to tell a gardener about the unbelievable beauty and intricacies that each flower holds and perhaps seeing them up close and personal in this way won't elicit such a strong response from everyone, but as I felt my throat tightening, my reaction surprised even myself. I don't normally do this in response to pictures of flowers. Each image has been created under perfect conditions - perfect lighting, black background, perfect angles. The flowers themselves aren't always perfect though, in fact, some of the most beautiful photos are of spent flowers and dusky seedheads. 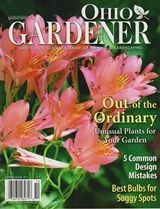 The photos are arranged according to the calendar year, with the first photos showing a flower's beginnings and the last ones as the flower gives way to dying petals, just as they do in the garden. The book is coffee table material, being of typical size for such tomes, and that's the best place for it, so it can be enjoyed by those who happen to sit within arm's reach of it. 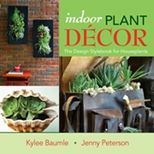 There are 280 pages and at a list price of $39.99 (Amazon price $29.19 and free shipping), there's really no excuse not to own it or give it as a gift. It's worth far more than its cost. Edvard Koinberg was born in 1964 in Stockholm, Sweden. He has worked as a freelance photographer and graphic designer since 1989, commissioned by press, businesses and organizations. 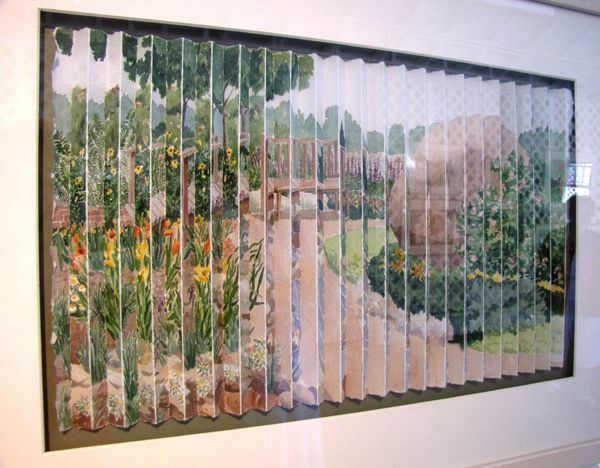 The last few years he has focused on personal projects, where plants and gardens are recurring themes, which has resulted in a number of exhibitions. 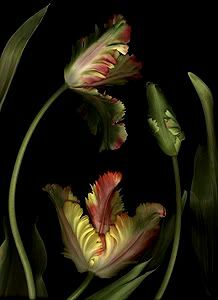 He has sought to depict plants following the artistic tradition of the Swedish Age of Enlightenment. Dutch painters from the 17th and 18th centuries have also been important inspirations. 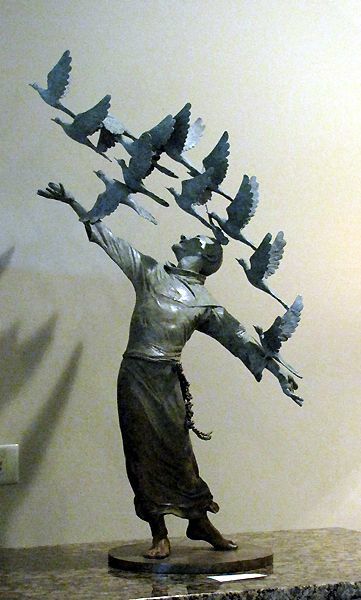 You may learn more about Koinberg and his work by visiting his website. The product or merchandise being reviewed in this blog post was the sole compensation for testing and reviewing the product. All opinions expressed here are mine, with no suggestions whatsoever by the manufacturer or distributor. If I like it, I'll say so. If I don't, I'll say that, too. It was a nice day on Sunday. 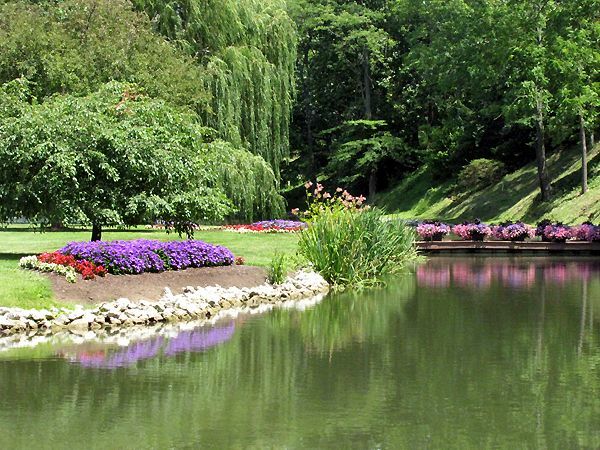 Perfect for taking a stroll through a garden. So we picked up Adam and Kara and headed north to Schedel Arboretum and Gardens. It was my second visit there this summer, but it was the first time for both Kara and Adam and Romie, too. 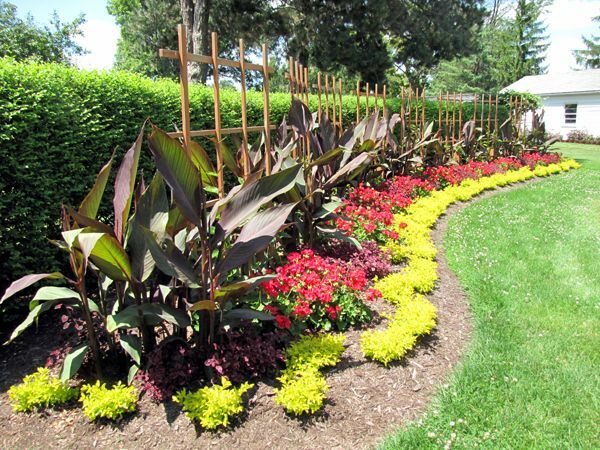 When the growing season is basically five months long, a month or two can make a big difference in how things look and Schedel was perfect proof of it. The annuals that were just being planted when I was there in May had matured into full and lush beauties, though the cannas are yet to bloom. This was my third visit ever, and each time I've been here was at a different time of year - fall, spring, and now summer - so I tried to focus on things I'd not noticed as much in previous visits. For example, I'd never taken the footbridge over to the other side of the lake. The view from over there is a different kind of pretty. 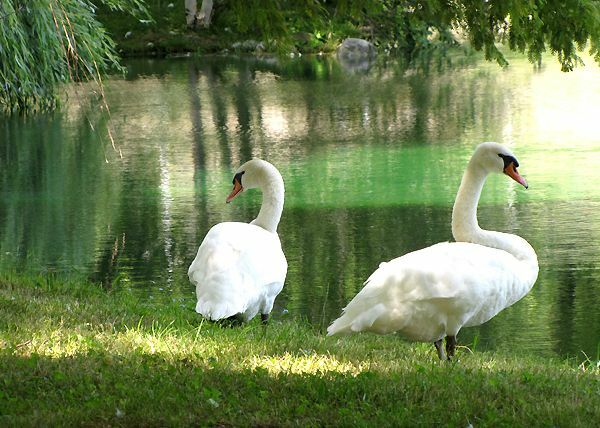 The swans were showing off for us. 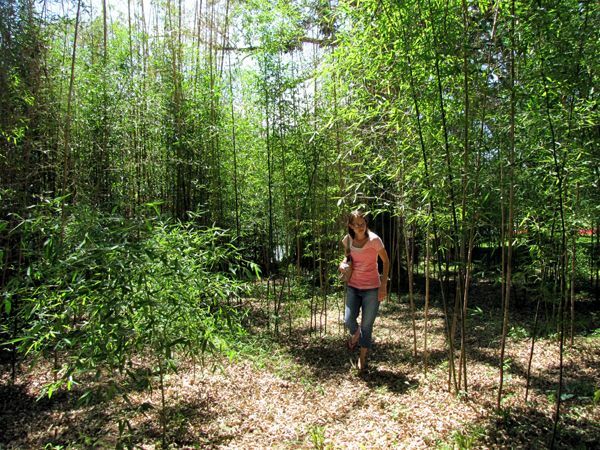 I didn't know there was a bamboo "forest" on the other side, complete with a path for walking through it. There was some poison ivy on the path, which Kara and I didn't notice until it was too late, and we had worn flip-flops, so we were sure to wash our feet as soon as we got home. Kara announced that she wasn't allergic to it, although both her dad and I are, so time will tell if she inherited our allergy or not. Actually, I hope we both were able to wash our feet soon enough before that question can be answered! 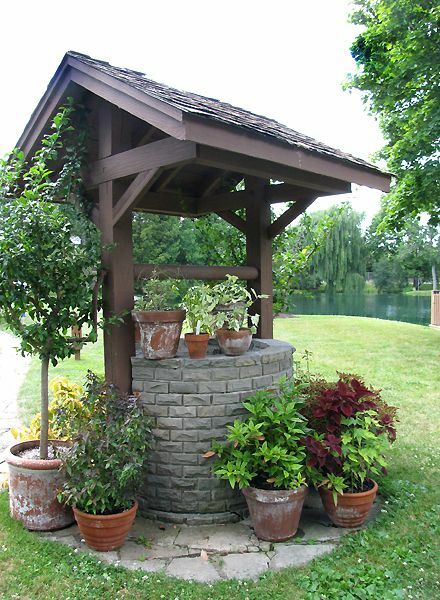 There are many containers with tropicals and unusual annuals grouped in various areas around the property. 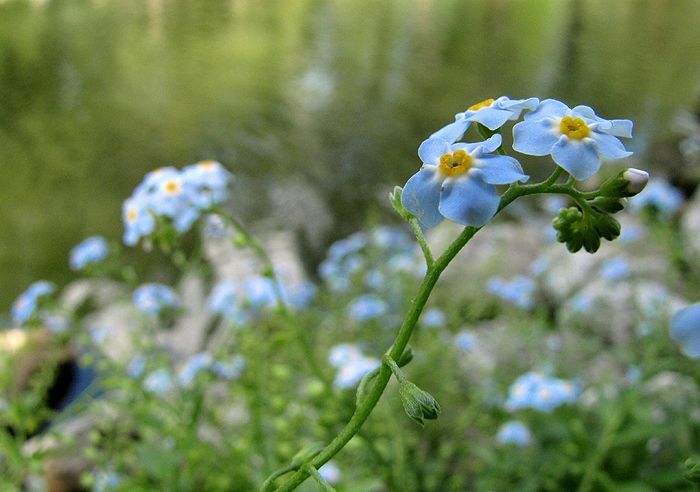 The Forget-Me-Nots were in full bloom down by the water. 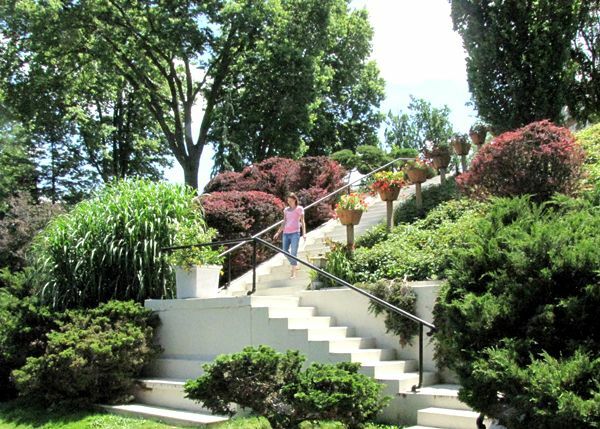 The stairway descending from the house area. If you look to your right once you reach the bottom of the stairs, this is what you see. 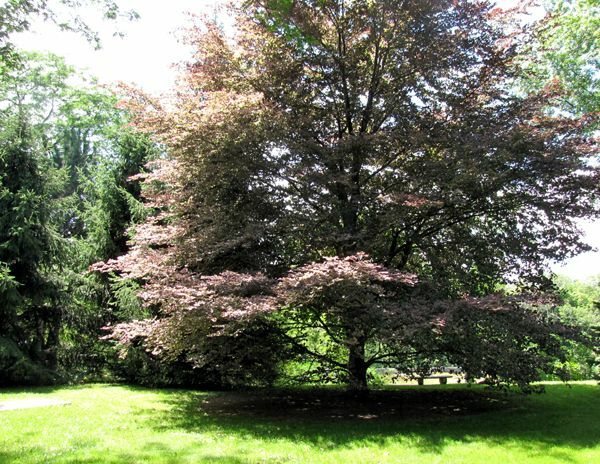 I'm coveting this gorgeous Tricolor Beech tree. 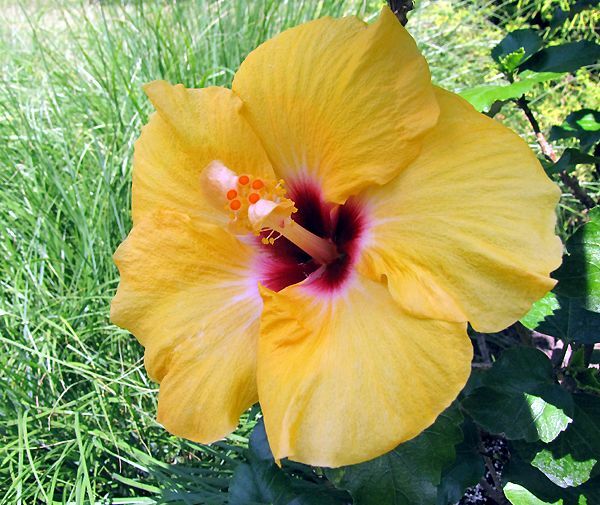 Several tropical Hibiscuses were in bloom. Art and sculpture are an integral part of the Schedel experience and there was an exhibition being held while we were there. 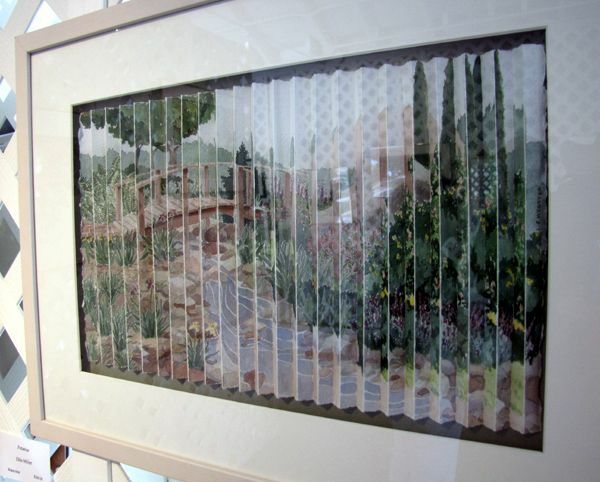 Here's a unique way of doing things - watercolor on pleated paper - that gives you two art pieces in one. I absolutely loved these works by Lucy Jane Webster. There were several on display and for sale at $350-400 each. Yes, it's the same picture! Schedel shares the excess plants from their gardens with the public by offering them for sale at prices too good to resist. The last time I was here I bought one Japanese Anemone plant for $2.00. There were more available this time and I bought two more to add to those I already have in my garden, since I now seem to have inadvertently stumbled upon The Secret to growing them. We couldn't leave Elmore without stopping at Bench's Greenhouse, just a few miles away, which was still selling their entire plant inventory at 40% off. 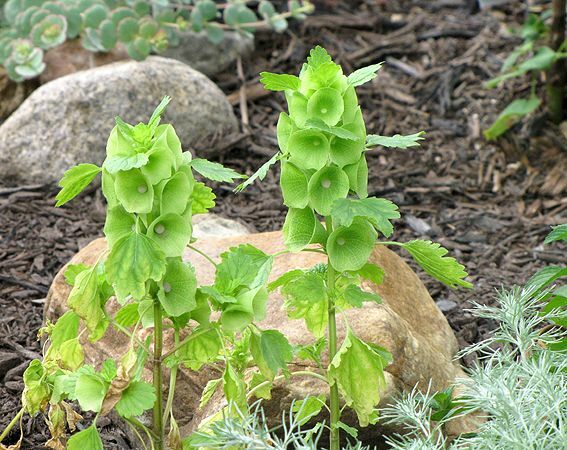 This time, I showed remarkable restraint, only purchasing two small Delphinium nudicaule 'Laurin' to replace one I'd had a few years ago. 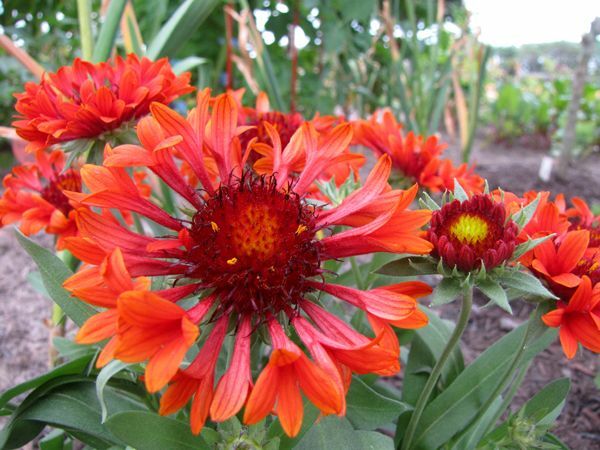 At that time, I didn't realize it was a perennial and planted a different plant in its place in the fall. The following spring, a small sprig of it came up, but transplanting it proved to be the fatal blow. 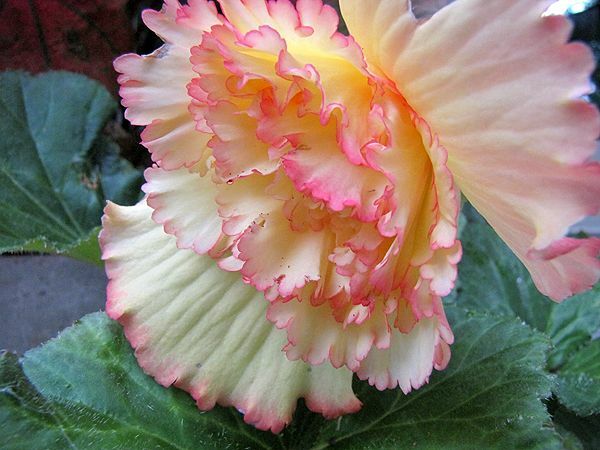 This is a charming plant that I'm glad to have once again.